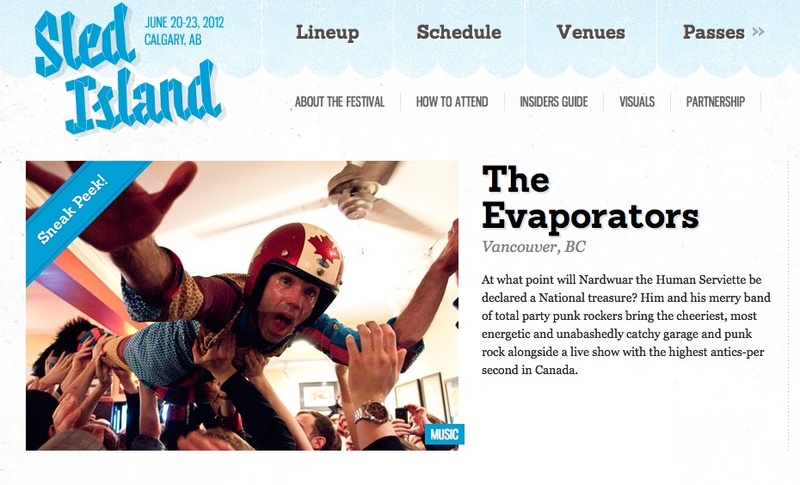 Nardwuar The Human Serviette News: The Evaporators to Play Sled Island 2012! The Evaporators to Play Sled Island 2012! The Evaporators will be playing the 2012 Sled Island Festival in Calgary Alberta! *Wednesday June 20- HiFi Club (following a screening of Bloody But Unbowed!) With Role Mach and Keep Tidy. Evaps on at 12:00 AM! *Thursday June 21- All Ages show at the National Music Center (Cantos) With Beakeeper + More ! Evaps on at 8PM! *Friday June 22 - Mint Records Party at the Ship & Anchor! With Ramblin' Ambassadors, White Poppy, Watermelon ! Evaps on at 5pm! Full Sled Island Schedule HERE!